Writing about music is a passion project for me. I’m not doing this for money. There’s nothing wrong with making money from music journalism; I hope that one day I can make some money, but as it stands now, this is a passion project because I truly love analyzing music and sharing that analysis with other people. There’s one other perk: getting contacted by bands whose music you may not have heard before. 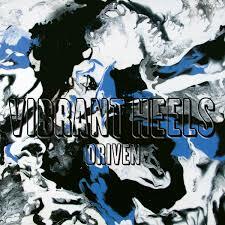 Vibrant Heels is one of those bands. I was recently introduced to their debut, Driven, and it’s the kind of album that successfully fuses multiple genres. I think you’ll dig it. Vibrant Heels was formed in Lévis, Quebec in 2015. The three of the four members already knew each other from a previous band called Upon Your Grave. The band mentions on their website that this new band was needed in order to “write songs that represented them better” and have “no creative borders”. With Alex Bussières on guitars, Manuel Allaire Durand on drums, and Jordan Jolicoeur on vocals, they already had the foundation of their new venture. They just needed one last piece of the puzzle to start their journey: Alex Rancourt joined Vibrant Heels on bass in April of 2016. And now, they were ready to make some new music and introduce their sound to their audiences. The first thing that struck me, even before I’d read anything about the band, was how much alternative influences I was hearing, but then I heard growls in vocals and some riffs certainly had a heavy metal flavor. It turns out, all of that was intentional. The situation kind of reminds me of Queen where every member had a different taste in music but they managed to turn that into an advantage. Vibrant Heels seem to have managed to do the same. Some of their influences are Led Zeppelin, Gojira, Haken, and Deftones, which explains the diverse array of sounds explored on the debut. My overall impression was that it is rather refreshing to hear bands being more courageous these days about not feeling the need to stick to one genre. I hope potential obstacles along the way don’t deter them from doing the same in the future. Their music is a good mix of alternative and heavy metal. So, if you are into the melodic side of things, this will be to your liking. The riffs are really catchy, and when the band does get heavy, they do that well too. As a guitar player, I was drawn to the guitar playing and Alex has some great rhythmic chops and the riffs are well written. The production is more for an alternative album than a metal album, which at times causes those riffs to get a little buried in the mix. And sometimes I wished the drums were more prominent – the way they usually are on metal albums. The guitar playing, especially, is so good that I think it deserves a heavier sound with more grit. But overall, the band sounds good and the songs are well written. I think each song has something cool to offer to the listener. Royal Mud kicks us off with a heavy riff. It’s definitely on the “metal” side of things! The vocals are harsh, which at times works well, but I thought for the sound they are going for, the clean vocals sounded a lot better. There’s some awesome groove on the rhythm, and the song has a super cool middle section that’s a good mix of alternative and metal. Then, we get to Soak It Up, which was the first song I heard from them. It’s very different from the album opener and shows a more melodic side of Vibrant Heels. This is where you start hearing all those different influences. I love the singing on this song – Jordan certainly has a great voice, I just happen to prefer the cleaner, more melodic singing. The song gets heavier towards the middle and Alex plays some great riffs – it’s those riffs that sound “easy” but once you get into it, they’re actually not, because you have to get the feel just right. As a guitar player, I can appreciate those intricacies. Running Girls is a faster track with some intricate guitar playing. There’s some cool double-bass drumming that is fairly subtle but when you pay attention, you realize how much it adds to the track. This one reminded me of Van Halen both musically and lyrically. It’s a rock ‘n’ roll tracks, but of course with a heavier tone! 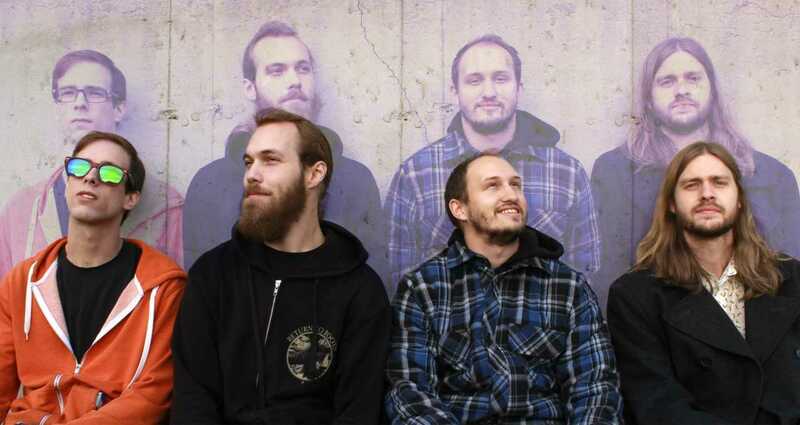 The self-titled next song goes back to the more melodic side of the band. There’s some really nice singing; with drums and bass holding a solid rhythm and letting Jordan take over with melody. The band does a nice job of switching into a more metal sound with harsher vocals and then go back to the melodic part; it’s always a nice way to keep your listener engaged when you can throw some curveballs like that. No band wants to get predictable! There’s a super cool riff around the 4:20 mark – I loved the groove and melody! Trick It is my favorite on the album. I think this song is the best representation of what this band can do. The guitar playing here is phenomenal – I mean, these guys know how to write a catchy riff, there’s no problem there! But the songwriting in general is well done because the song goes from a Pearl Jam kind of vibe into a more metal sound without a glitch. This song also goes through so many transitions, it’s not just from alternative to metal, there’s so many different riffs, vibes, and moods explored here. We always go back to the main riff at some point, but the band explored a lot of different areas in between and you just don’t know where you’re going to go next. If you’ve been reading my reviews, you know I love songs like that! By the way, there’s also some intricate drumming going on here! But, and I’m going to repeat this, this band needs a more metal sound – there are so many great riffs here – they deserve more air to breathe! Check out the YouTube video below where Alex Bussières and Alex Rancourt do an awesome playthrough. As we get nearer to the end of the album, Sun Goddess features intricate riffs, giving me a Van Halen meets Red Hot Chili Peppers kind of vibe. It’s got a good tempo and the band explores some riffing with the wah pedal that I think worked well with the vibe they were going for. But just listen to the main riff – I think all guitar players will dig it! And last but not least, Bad Milk starts us off with a darker, Alice in Chains kind of vibe. AIC is one of my favorite bands, so no complaints there! But then, they explore a funkier sound which is a lot closer to Red Hot Chili Peppers. I dig the variety in songwriting. There’s another great metal riff after the 3:00 mark with some catchy vocal melody. It’s a good way to close the album. Vibrant Heels is currently busy with pre-production of their follow-up to Driven. The band hopes to release it in the summer of next year. I’m certainly looking forward to it!